BACKGROUND: Mobile Health is the utilisation of mobile devices like cellphones and tablets for the delivery of health care. It is an up and coming intervention promising to benefit health services. Recent mobile health studies have tended to focus on mHealth for data collection and surveillance rather than on actual patient care. This paper highlights the potential and the challenges of mHealth use in the delivery of health care services. OBJECTIVES: This paper focused on determining the use of mHealth and identifying and describing the opportunities and the challenges faced by the medical doctors in using mHealth at a specific health care facility in Zimbabwe. METHODS: A quantitative, descriptive, cross-sectional and analytical design was used to determine the rate of utilisation of selected mHealth "patient identification and treatment activities" by medical doctors. A structured questionnaire was used for data collection form 104 respondents. The number of the returned complete and usable questionnaires was 42. No sampling technique was done because the whole population was of interest to the researcher, accessible and available during data collection. RESULTS: Fifty percent (50%) of the respondents indicated, lack of knowledge and un-awareness in using mHealth to support chronically ill patients. The majority of the respondents (83.3%) believed that mHealth presented opportunities to improve health care delivery. The majority of the respondents (95%) indicated the potential for its future use. CONCLUSION: Given the challenges that were encountered mHealth program to be officially launched for mHealth use and the users to be developed on its utilisation. According to Clausan, Elrod, Fox, Hajar, and Dzenowagis (2013), mobile health (mHealth) is defined as the use of mobile devices and global network to deliver health services and information. Mobile devices most commonly used include cellphones (feature phones and smart phones) and tablets (Clausan et al. 2013). The emergence of mobile phones as a ubiquitous device for communication has brought forth innovations for many sectors of society including medical doctors in the health sector. A comprehensive report on the global wireless industry lists 101 specific health-related activities that can be conducted by using mobile phones. Despite this list being nine years old, some of the items on the list remain speculative in their implementation. Some of these are: medical data on sim card, access of patient records through mobile devices and medication compliance monitoring. This article looked at "patient identification and treatment activities" of the 101 suggested uses of the mobile phone in health, and investigated to find out which ones had been adopted by medical doctors at one major hospital in Zimbabwe and what the adoption rates were. Furthermore, despite the availability of evidence of an increased mobile communication penetration rate in Zimbabwe, there is no evidence of the progress mHealth utilisation (Wireless Healthcare, 2005). Zimbabwe's health care facilities have been slowly embracing mHealth. According to the literature review conducted by the World Health Organization (WHO) and the Millennium Villages Project it is suggested that most documented information about mHealth is for projects conducted in developed nations rather than developing and underdeveloped nations (Mechael & Sloninsky, 2008). The WHO, in summarising global mHealth activities, mentioned that results based evaluation of mHealth implementations was not being conducted (WHO Global Observatory for eHealth series, 2011b). Zimbabwe being an underdeveloped country is one of the countries which lacked documentation on the mHealth projects which have been conducted. The use of mobile phones by medical doctors in Zimbabwe for health care is relatively unknown. In conducting a literature review, the researchers could not locate information on the uptake of mHealth in Zimbabwe by medical doctors. Most mHealth projects the researchers came across during a literature review were for data/information management. According to an Indian electronic news site Sullivan (2011),a doctor from India's Apollo Telemedicine Networking Foundation said: "... there is a need for mobile health care to be driven by the needs of patients and doctors, and not by whatever the technologists are currently working on". According to Dhanraj (2011), mHealth projects are now operating in a number of developing countries and some are demonstrating an impact on public health. The mHealth field promises to offer opportunities for health providers across multiple sectors that include governments, businesses and non-governmental organisations (NGOs). While mHealth is promising benefits, studies have also shown that there are currently challenges in implementation on the ground. Some of the noted challenges include: acceptance of mHealth by end users and health care providers particularly in developing countries (Ganapathy & Ravindra, 2008), acceptance of the technology by the elderly (Whittaker, 2011: 3), lack of availability of customised solutions for the developing countries (Ganapathy & Ravindra, 2008), and security in using mHealth applications where data being handled is of a confidential nature (Mechael et al., 2010). In Zimbabwe the WHO noted the following as barriers to mHealth implementation: lack of policy framework, underdeveloped infrastructure and the perceived costs of implementation being too high (WHO Global Observatory for eHealth series, 2011a). 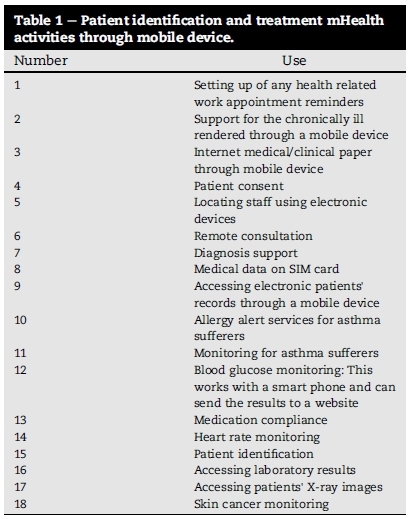 This article considered the list of 101 suggested specific health-related activities that can be conducted by using mobile phones as a frame of reference but only identified 18 "patient identification and treatment" mHealth uses from the list. The article focused at those 18 "patient identification and treatment activities" use of mobile phones in health care. Furthermore it investigated which ones had been adopted by medical doctors. These included the identification and description of the opportunities and challenges they have encountered, particularly in the specific health care facility setting in Zimbabwe. Refer to Table 1 for patient identification and treatment activities. The reason for focusing on the 18 uses is because most studies conducted in Africa focused on disease surveillance and health data collection neglecting the actual patient care (Mechael & Sloninsky, 2008). The reason for this article was to address the identified information gap of neglecting actual patient care in mHealth use. The findings were based on the use, opportunities and challenges of mHealth. The findings provided knowledge on the importance of adoption of "patient identification and treatment activities" of mHealth and provide future mHealth users in Zimbabwe with information. Mobile health (mHealth) is defined as the use of mobile devices and global networks to deliver health services and information (Clausan et al. 2013). This article focused on patient identification and treatment activities. In the context of this article health facilities imply any facility that provides health care services whether private or public. In the context of this article these activities are those that are related to the uses of patient demographics and patient treatments. A quantitative, descriptive and cross-sectional design was used to determine the rate of utilisation of selected mHealth "patient identification and treatment activities" by medical doctors, at a specific health care facility in Zimbabwe and the challenges and the opportunities they have encountered of mHealth utilisation. The design was descriptive because the information was collected from the population of interest and descriptive measures were used (Bowling, 2009). The numerical pictures of the results are presented. Cross-sectional design was employed because data was collected at one point in time (Bowling, 2009). The research was conducted in one health care facility in Zimbabwe. The health care facility was chosen because it is where the researchers identified the problem. The sample population comprised all the medical doctors working at the health care facility. The population size included 116 medical doctors and excluding 14 that had participated in the pretesting (n = 4) and reliability (n = 10) testing of the research instrument. Of the sample population only 104 medical doctors were accessed. These were the doctors available during the data collection period of the months of August and September 2013. The whole population was used hence there was no sampling technique. A self-administered questionnaire was used for data collection. It comprised of closed-ended questions (N = 37) being demographic data (N = 5), yes or no questions (N = 8) and Likert scale format (N = 24) and an open-ended question about the challenges they have encountered in using mHealth (N = 1). The questions were in English and focused on basic health activities that the respondents' normally engage in. These basic health activities included questions related to cellphone use like setting up health and work related appointment reminders, scheduling medication reminders, support for the chronically ill, internet medical/clinical research, seek patient consent, diagnostic support and remote consultation. Other mHealth activities included questions related to appointment reminders, appointment scheduling, medication reminders support for the chronically ill, internet medical/clinical research through mobile device, patient consent, locating staff and remote consultation. A statistician was consulted in designing the questionnaire to enhance content validity. It was pre-tested by four medical doctors to enhance its validity Parahoo (2008), and the medical doctors' recommendations were used to revise the instrument by the researchers. To enhance the reliability of the questionnaire the use of ambiguous questions as well as areas of overlap was avoided and explanations for the activities were clarified. The self-administered questionnaire partly used a Likert scale. The reliability of the questionnaire was also tested using the Cronbach's reliability coefficients. Data collection was done over a period of one month, from 26 August to 27 September 2013. The permission to conduct the research was obtained from the Higher Degrees Committee of the Department of Health Studies, University of South Africa (Unisa), the central hospital Ethics Committee and finally from the Medical Research Council of Zimbabwe (MRCZ). To ensure anonymity of the respondents, codes were used. These codes were not traceable to the consent forms since the consent forms were not numbered or coded. In order to access the respondents the questionnaires were distributed to the various departments of the health care facility. In each department the respondents were met with in the meeting room for distribution of the questionnaire. The respondents were to sign the consent form before they participated in the study. The informed consent form gave the respondents adequate information regarding the study (Polit & Beck, 2006). It was customised from the MRCZ informed consent form template and was approved for distribution to the respondents by the MRCZ. Out of 104 distributed questionnaires only 48 were returned, 6 had incomplete data and were therefore rejected giving a final figure of 42 usable questionnaires or 40% of the population for analysis. Thus a response rate was 46%. After distribution of the questionnaire the respondents' names and their mobile phone numbers were recorded in a book for follow-up purposes. The collected questionnaires and consent forms were kept locked in a cupboard at the researcher's place of residence. Data from the received questionnaires was first checked for errors and missing values. Only 42 were completed and considered for data analysis. The data was then entered and analysed in consultation with a statistician using the SPSS (version 20) statistical software. Descriptive statistics and exploratory data analysis was then used to summarise the data. Tables were used to present the data. Chi-square was used to test the null hypothesis of association between variables. The extent of the analysis performed on the data was guided by the objectives of this article. Of the respondents 61.9% (n = 26) were males and 38.1% (n = 16) were females. The mean age of the respondents was 32 years, the youngest was 25 years, 12% (n = 4) and the oldest was 50 years, 2% (n = 1). A total of 64.29% (n = 27) of the respondents in this study were from level 1 and level 2 categories (0-2 years' experience). These are the junior doctors (0-2 years' experience). Of the total respondents, 90.5% (n = 38) owned a smart-phone compared to 9.5% (n = 4) who owned a basic cellphone. The type of cellphone used in this article therefore does not present itself as a significant confounding variable to mHealth use since 90.5% (n = 38) of the respondents used similar devices. The specific health facility's medical doctors location and internet medical article scored 90.5% (n = 38) of mHealth utilisation rate. All the male respondents 84.6% (n = 26) compared to 75% (n = 12) of the female respondents use their cellphones in work related call activities. All the female respondents 100% (n = 16) used their cellphones to conduct medical research over the internet compared to 84.6% (n = 22) of the male respondents. Activities that involve medical doctors having to contact patients were not used most often by medical doctors at the health care facility. These activities are: support for the chronically ill, 40.5% (n = 17) and seeking patient consent, 9.5% (n = 4). • Internet medical/clinical article 95.20% (n = 40). All female respondents, 100% (n = 16), agreed that this activity presented opportunities for improving health service delivery compared to 92.3% (n = 24) male. • Diagnosis support 95.2% (n = 40). All female respondents agreed that this activity presented opportunities for improving health service delivery compared to 92.3% (n = 24) male. • Allergy alert service for asthmatics 95.2% (n = 40). All male respondents agreed that this activity presented opportunities for improving health service delivery compared to 87.5% (n = 14) female. There is a general agreement between the male and female scores for all the activities above implying that the two groups agreed with the potential to use these activities if the specific health facility were to implement them. Compared with females, male respondents had a generally higher mHealth utilisation rate in six of the seven mHealth activities. These are: Setting up any health and work related appointment reminders (male = 84.6%, female = 75%), support for the chronically ill (male = 57.5%, female = 12.5%), seeking patient consent (male = 15.4%, female = 0%), medical doctor location by the hospital (male = 100%, female = 75%), remote consultation (male = 84.6%, female = 62.5%) and diagnostic support (male = 76.9%, female = 75%). Females had a higher use rate in the internet article activity (female = 100%, male = 84.6%). Using the Chi-square test, the hypothesis that there is no association between gender and any one of the activities was tested and the following two activities returned significant results: Gender versus "chronically ill" returned a P value of 0.004 suggesting that gender is associated with this activity. The reason for this association is not apparent. Gender versus "locating medical doctor" returned a P value of 0.007 suggesting that gender is associated with the mhealth activity. The P values for the other activities that showed no association with gender are shown in Table 3. While male and female respondents differed on the order of the most important mHealth activities, they generally agreed on the least important or those presenting the least opportunities to improve service delivery. This list in descending order consists of the activities listed in Table 4. More than half of the respondents 43% (n = 18) agreed that using mHealth in seeking patient consent presents the least opportunities to improve health service delivery. This was the only activity that had an overall score below 50% (n = 21). The following activities which the responses were to be yes or no, were widely adopted at the specific health care facility in Zimbabwe. They are, setting up any health and work related appointment reminders 81% (n = 34), remote consultation 76.2% (n = 32) and diagnostic support 76.2%. With regard to the questions on Likert scale format, generally the respondents agreed that all mHealth activities with the exception of the "patient consent" activity presented opportunities to improve health services delivery. The supporting chronically ill activity was one of the least used activities 40.5% (n = 17), the majority of the respondents 83.3% (n = 35) still believed that it presented opportunities to improve health care delivery. Internet medical/clinical research, diagnosis support and allergy alert service for asthmatics also have a higher potential of being adopted and implemented in the researched health care facility % (n = 32). 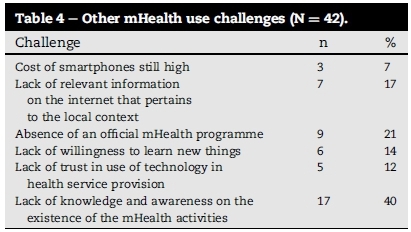 Respondents mentioned a number of challenges in using mHealth and these challenges were related to the type of use. For internet research 29% (n = 12) of the respondents mentioned bandwidth availability as one of the reasons for failure to access medical related internet research. Access to internet pages is slow and too unreliable to warrant the internet as a reliable source of information. In relation to this technical limitation, 21% (n = 9) of the respondents also mentioned the small screen size of cellphones as a challenge to mHealth use. Half of the respondents 50% (n = 21) either lacked the knowledge or were not aware of the use of mHealth in supporting the chronically ill. The absence of personal emotions were described by 55% (n = 23) of the respondents as a barrier in use of mHealth to support the chronically ill. The underlying reason being that remote support eliminates the opportunity to physically assess the progress of the patient. Weight loss, skin condition and other physical appearance disorders are some of the symptoms that a remote support system would hide from an assessing physician unless accompanied by video which currently does not work well due to bandwidth limitations. A relatively high number of respondents 31% (n = 13 preferred not to have their phone numbers known by their patients. This could imply that mHealth activities that expose health practitioners' mobile phone numbers to patients could face the highest resistance in adoption. Furthermore the issue of ethics and the need for a signature 17% (n = 7) on the consent articles could mean that mHealth activities involving patient signatures could also face high adoption resistance by medical personnel and have the least potential. Other mHealth challenges mentioned were indicated in Table 2. The results show that 21% (n = 9) of the respondents mentioned that the lack of an official mHealth programme as a hindrance to mHealth use. This is because some of the mHealth activities would require infrastructure to be set up by the health care facility. Related to this challenge was the lack of willingness to learn new things, 14% (n = 6). This challenge could be overcome with the presence of a proper official mHealth programme and users undergoing training. Some respondents mentioned lack of trust in the technology 12% (n = 5). Based on the results of this study, this article discussed mHealth utilisation and the challenges to its utilisation below. It has been revealed that the internet for medical research and medical doctors' locations were the most common mHealth activities at the specific health care facility in Zimbabwe. The areas of research mentioned were: management of diseases, side effects of medicines, literature reviews and accessing the Medscape reference. Even though internet research was the most used mHealth activity there were others which were fairly used. These were, setting up any health and work-related appointments, remote consultation and diagnostic support. Most of the respondents owned smartphones although the cost of owning a smartphone and internet bandwidth were raised as one of the challenges to mHealth use. Cellphones with small screen sizes do not promote mHealth use either. The use of the cellphones for work-related calls has also been adopted, however, with more males 100% (n = 26) than females 75 (n = 12) using cellphones for work-related calls. The high popularity of internet research activity could also suggest that mHealth activities that involve access to information, if implemented, have a high probability of success. It is also estimated that that smartphones will continue to decline in price according to technology market-research firm (International Telecommunications Union, 2013). Internet medical research by medical doctors has more potential for growth and the availability of useful content that will be readily accessible to medical doctors could improve their efficiency. This content could take the form of standard treatment guidelines, dosages and diagnostic support (Bateman, 2011). It should be noted however that statistics according to the "ICT facts and figures" report by the International Telecommunications Union (2013), report that in the developing world 16% fewer women than men use the internet. This difference in use rates between male and female is in contrast to the results of this research. Using mHealth to support the chronically ill as well as seeking patient consent were the least used mHealth activities. The low rate of utilisation of mHealth in supporting the chronically ill is in agreement with a study by Ibembe (2011), who mentioned that health providers rarely used cellphones for contacting patients. The evidence of resistance and the challenges of some of the mHealth activities could suggest that mHealth's potential needs be demonstrated to potential users. Half of the respondents 50% (n = 21) either lacked the knowledge or were not aware of the use of mHealth in supporting the chronically ill. The results of this article in this particular aspect are synonymous with those of research conducted in Ethiopia to article the adoption of mHealth and it was concluded that with particular focus on diagnosis and treatment, the majority of health care workers were not aware of the possibility of using mHealth to improve health care delivery. Even if the health care workers were not aware of the impact of mHealth, some were using it, only being unaware of the fact that they were actually practicing mHealth (Kumar & Svensson, 2012). The small size of cellphones was also mentioned as challenge to mHealth use. This finding is in agreement with the findings by the (WHO Global Observatory for eHealth series, 2011b). This finding and the challenge could be short lived since the screen sizes of smartphones have been increasing especially with the emergence of touch screen devices. The results of this article agreed with other research done at Nakuru hospital in Kenya in which it was observed that patients used mobile phones to consult health providers and health providers rarely used cellphones except during emergency cases like deliveries (Ibembe, 2011). This is important for mHealth implementers as this result shows that activities that involve medical doctors initiating contact with patients may be the least favourable by medical doctors and therefore least likely to be successful or will not be easily adopted by medical doctors. Medical doctors accepted that mHealth presented them with opportunities to improve service delivery. The nonengagement in mHealth activities was due to factors that include lack of awareness, confidence in the technology, cost and the absence of an official mHealth programme in Zimbabwe. • This research was conducted at one health care facility in the country out of the available five. The results cannot therefore be generalised to the entire population of medical doctors in Zimbabwean health facilities. • The focus of the research was only medical doctors but the possible list of mHealth users could include nurses, pharmacists, lab technologists, radiologists and patients. Knowledge about the existence of mHealth is generally lacking among medical doctors at the studied health care facility. The successful use of mHealth by medical doctors to improve health outcomes will require the institution to educate the doctors and other health team members on the benefits of mHealth as well as advocating for the innovative use of mobile technology in health care practices. mHealth program should be officially launched to ensure uniform usage of mHealth devices. The results of this article revealed that there are opportunities to utilise mHealth activities and in general medical doctors would like to try certain mHealth activities. Furthermore the results of indicated that there are barriers to adoption of mHealth activities that have to be overcome for mHealth to significantly contribute to service delivery. C (University of South Africa) is the author of the article, conducted the research, K.A. (University of South Africa) provided guidance and assisted with writing of a manuscript. This article was based on research done by the first author at the specific health facility in Zimbabwe for a Master's in Public Health (University of South Africa). Thanks to the supervisor Dr KA Maboe for assisting me to write this article and her supervision. We are thankful to the respondents of the study being employed medical doctors at a specific health care facility in Zimbabwe. * Corresponding author. P.O. Box 392, UNISA, 0003, South Africa. E-mail address: maboeka@unisa.ac.za (K.A. Maboe). Peer review under responsibility of Johannesburg University.